Deciding when it’s more appropriate to undergo IUI or IVF is a personal choice and, as we’ve covered in the previous six lessons, there are multiple factors to consider. In this lesson our goal is to describe which approach is more favorable, depending upon each priority. As you’ll recall, many women should not consider IUI at all because the nature of their fertility issues won’t allow IUI to be of help. These include women with severely diminished ovarian reserve, both fallopian tubes blocked, or a partner who has an extreme case of male factor infertility. To help you weigh whether to do IUI or IVF, we've developed 6 key criteria (and which treatment wins out in each) that you may want to consult in making your decision. Which criteria are most important is a personal decision. Women who start with IVF as opposed to IUI, or switch earlier from IUI to IVF, record faster “time to pregnancy.” In one well-regarded study, women who started IVF immediately conceived faster than women who initially tried two IUI cycles before converting to IVF. Provided women who fail with IUI discontinue treatment after a few cycles and have the ability to do multiple IVF cycles, their odds of ultimately taking home a baby should be similar to women who started with IVF or embarked upon it earlier. Each IUI cycle costs roughly $500 - $4,000 while IVF typically costs $20,000. 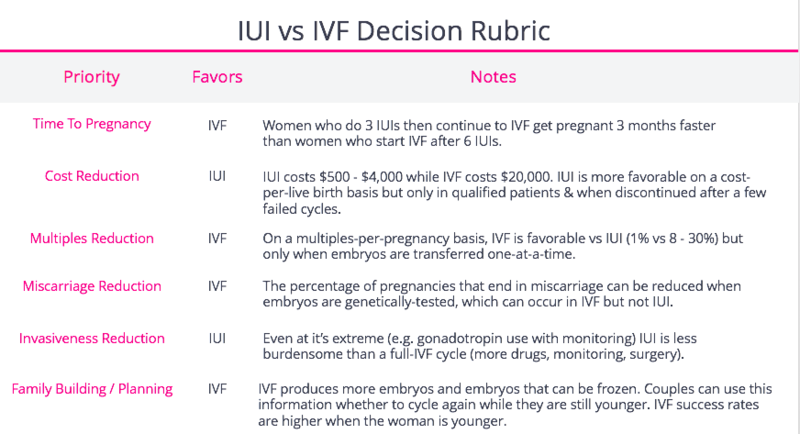 On a “cost-per-live-birth” basis, IUI looks favorable. 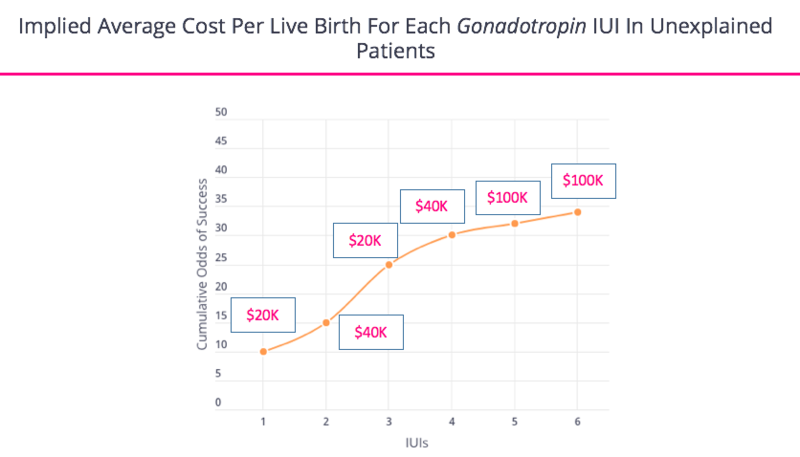 However, after roughly 3 IUI cycles most IUIs will not work and and at this point the “cost-per-live-birth” for each additional IUI becomes unacceptably high. Those fearful of conceiving with multiples should strongly consider IVF and only transferring one embryo at a time. In these circumstances, just 1% of pregnancies lead to twins, and triplets are even more rare. Alternatively, 8 - 30% of medicated IUI pregnancies lead to twins. Finally, the least preferable circumstance is do to IVF with multiple embryo transfer, where in women under 38 years of age, 30% of pregnancies culminate in a multiple birth. Women especially apprehensive about suffering a miscarriage (as opposed to not conceiving in the first place) are better off doing IVF with pre-implantation genetic screening. While PGS costs an additional $5,000, in older women it reduces the risk of miscarriage substantially. IUI creates less burden on patients than IVF does, but it can still be demanding. While IUI cycles often require taking oral medication, attending a handful of monitoring appointments and the insemination itself, IVF often demands weeks of monitoring appointments, self injecting hormones, a surgical procedure to retrieve eggs and another appointment to transfer embryos. Undergoing IVF places heavier calendar and travel restrictions on patients than IUI does. Having extra embryos from IVF creates more options but, of course, some people might feel that having extra embryos as a negative, and deciding what to do with unused embryos in the future can be difficult. Does a Doctor Have to Perform the IUI? Is A Second Insemination Helpful?